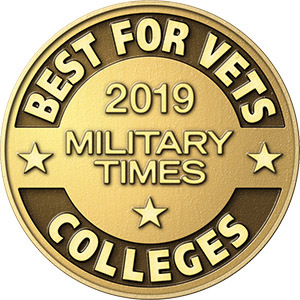 MACOMB/MOLINE, IL -- For the ninth consecutive year, Western Illinois University has been selected as a Military Times "Best for Vets College" by Military Times magazine. Western is the only Illinois public four-year university in the top 80 among four-year schools and is one of two Illinois public universities appearing on this year's four-year schools' top 100 list. According to the Military Times, 208 schools - from four-year to two-year, public, private and trade schools - responded to a survey detailing programs, policies and resources for veterans. Selection criteria included cost and financial assistance, academic outcomes/quality, university culture, academic policies and support services. "Fewer than half of the roughly 500 college and universities that competed for the recognition earned the right to call themselves Best for Vets in 2019," noted Military Times in a recent press release. "Their efforts should be commended." "Western Illinois University has a long history of serving veterans and active service members. The continuous acknowledgment of the programs and services that Western has in place demonstrates our institution's support of our military women and men," said WIU President Jack Thomas. The center has established partnerships with various campus and community organizations. Students gain direct access to a comprehensive array of services such as VA benefits, financial assistance, disability resources, health care, career development and personal wellness. The center also features computer access, a study/meeting space and student-veteran peer assistants who work with student-veterans. Western's Beu Health Center partners with the Iowa City VA Healthcare System to provide the only tele-mental health facility in the nation to be located on a college campus. The Center for Military/Academic Transition and Health (CMATH) on the WIU campus provides tele-mental health services through secure video conferencing to WIU student veterans, as well as community veterans who already have their military benefits in place. Contact the CMATH clinic at (309) 298-3697 for further information.